this week we have a super giveaway from the vintageholic frog -- i just love all things vintage and i'm excited to have this shop featured this week. Hello! Please tell us a little about yourself! My name is Maria. I am 26 years old and I live in Chicago. I am obsessed with all things vintage. I opened my Etsy shop, The Vintageholic Frog, to share my finds with the world. I’m married to a tall, dark and handsome man and there is always coffee and chocolate in my house. Life is good. What started your love for vintage? My mother is the reason I am obsessed with vintage. When I was little, she would take me with her to the thrift store at least twice a week. I looked forward to these trips because she would give me money to spend on anything I wanted and in the thrift store $5 could get me 10 books, a bag of plastic jewelry, and a board game- all this and I would still have some leftover pocket money! As I grew up, I became aware of the beautiful Pyrex, the clip on earrings, the paint by numbers, and the books with worn covers. I started seeing thrift stores through my mom’s eyes and I was in love. My mom is still my favorite thrift store shopping companion- and I try to shop with her at least every other week. What inspires you from day to day? Blogs! I honestly don’t know how I lived without them for so long. And pretty nail polish. I always feel more creative when my nails are bright and colorful. You've had great success with your shop! Any advice for friends who are thinking of starting up their own shop: Do what you love. I think when you are passionate about your shop and products it motivates you to work harder and I’m a firm believer that hard work will always lead to success. 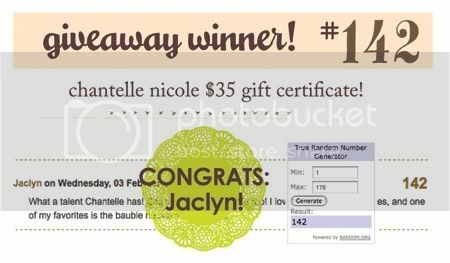 who was the winner of the nicole chantelle giveaway! I am such a sucker for vintage children's books (who isn't, though? )...Especially the one called Too Many Mittens... so great! The Berggern wood cutting board reminds me of the kitchens of all the grandmas in my old neighborhood. I think my favorite is the vintage HH JAPAN cast iron OWL candle HOLDER. Very cool. 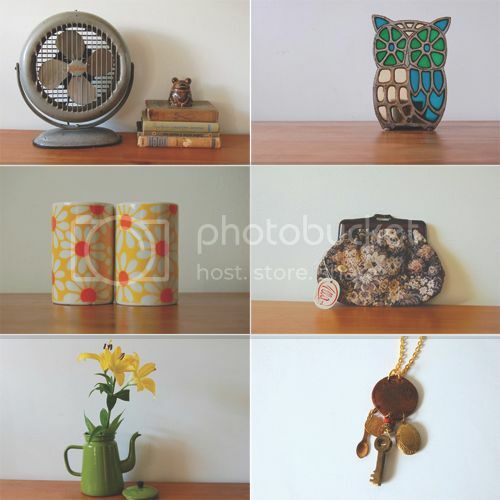 oh, there's just so many lovely vintage stuff! I especially adore the over sized glasses and the books! My favorites are the three milk glass vases. So pretty! I think the cocker spaniel paint by numbers is just the cutest! I couldn't decide between all of the books so I decided to go with the planter - http://www.etsy.com/view_listing.php?listing_id=27334570 which I love and makes me excited for new plants. I am so glad you posted about this darling shop - I love everything! but I especially love the paint by number kittens. Those will be mine one way or another - thanks for telling us about Maria! I LOVE the vintage GREEN GLASS canister set. 3 jars!! SO pretty! Ahh the Vintage Green glass or the milk glass.. or well.. just about anything! NIce giveaway! What a lovely shop :) My favourite is the Ephemera pack No. 3.
all of the items are just lovely. but my fave is the OLIVE and BLUE cheese and cracker TRAY...the colors and graphics are so cool!! thank you for sharing this shop! just purchased two lovely little trays for my tray collection. The vintage set of aluminum canisters is so much fun! what a lovely shop! I can't choose just one item, everything is wonderful! I never knew about this shop before-- I love it! My favorite item in the shop is the trio of milk glass vases. I would use them at my wedding! I think my favorites are the brass filigree basket and the vintage jewelry. What a great shop! I love the St. Thomas leather wallet. I love the vintage mushroom canister set!! I can't get these out of my head. yay for vintage! I like the mushroom canister set, they would look so cute in my sewing room. 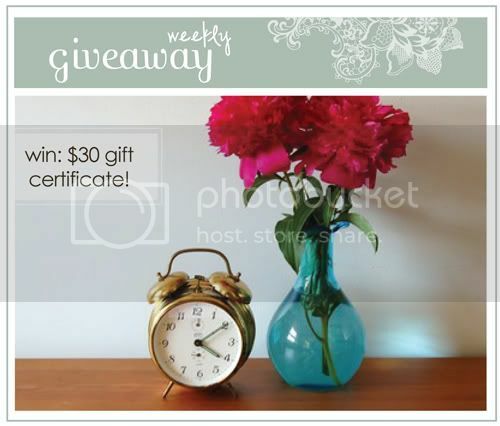 i am in love with this giveaway! all these vintage items are all so adorable, i wish i could have a house full of them. All the stuff on that site is adorable! The owl candle holder is so cute! A must have. I love the vintage aluminum canister set! I love the set of 5 green glasses. They remind me of the ones my grandma used to have. I'm loving the olive and blue cheese and cracker tray! Perfect for entertaining guests at house parties! Cheers! Wow what a great selection of vintage goodies. I really like the Sienaware canister set. wow...it's really hard to choose. i love the blue ivy pyrex dish, the destash mixed buttons bag, and the seven dreams fairy tale book. great giveaway...thanks! I'm totally digging the Milk glass vases...oh and that vintage kelly green box handbag! Retro love! those green glass jars would be awesome. or maybe the enesco heavenly friends wall plaques! I don't post about other people's giveaways, but I am always sure to give credit where credit is due when I win something! I LOVE the vintage pyrex nesting bowls. My mom has the SAME set! such good taste in that shop! I love the milk glass vases. i think i am obsessed with the vintage ceramic SALT and PEPER SHAKER set!! my favorite is the brass clock that you have pictured above. classic! This is such an interesting Shop!! Thanks for introducing it to me! I'd have to say my favorite item is the Vintage electric fan!!!! Love it!!!!! Love the olive green enamelware coffee pot!! That green enamel pot would be perfect in my kitchen!! who doesnt love the owl candleholder??? I love the mod circles tea set! Love the little EPHEMERA packs. Oh what a fun giveaway! I love *all* things vintage! if i had to pick my favorite, i really love the floral clutch! i would actually love to have everything from your shop haha! I love vintage, and all the things in Maria's shop are so affordable too! I really like the green goblets and the MOD decorative plate, and the Oops froggy coin bank. Oh how lovely! There are sooooo many things to choose from. I like the daisy salt and pepper shakers. This shop makes me want to spend money. i would get some vintage books or the floral clutch! my fav items have to be the vintage floral clutch and the vintage KELLY GREEN box handbag!!! They r beautiful!!! Thanks for the giveaway!!! I adore owls and have a few things, so of course I just looove the owl bookends. I am also a bookaholic. The vintage books are awesome, especially the Elvis one! I also love the glasses and the dolphins figurine. What a great selection! oh i love the vintage floral brooch! I love the vintage green glass and the milk glass bottles. I'm a sucker for all things squirrel related! I have to go for the vintage squirrel with acorn basket. Adorable. Hmmm...that Cast Iron Cookbook is mighty lovely! oh i love the milk glass vases! I like the cast iron candle holder - and the mouse coasters! Such fun in this shop. awww! love, love, love those vintage children books! the vintage olive enamelware coffee pot is too adorable as well! My favorite is the vintage dolphin brass figurine! I love dolphins! :] I also really like the purple and pearl beaded rope necklace! So pretty!!! There are some gorgeous green glasses I would love to get my hands on!!! I love the vintage green glass but there were lots of other things I want too! Love the store! Definitely will add it to my list. I adore the children's book Giant John. So many beautiful things and in lovely condition. I love the vintage aqua bill dorf handbag! i remember my mom taking me to the thrift store and buying us plastics FULL of toys and little figurines for a few dollars. it was the highlight of our days. i owe it to my mom too. i also owe my momma for my love for THE KING, so my fave item from Maria's shop is the Elvis book- hands down. I am not a vintage glasses collector, but I might just start collecting with the shop's over sized set. They're gorgeous. So many gorgeous vintage things! So hard to pick. I think my fave was probably the milk glass vases. Sweet. I love the Valentine frogs! Kawaii. The history of costume book, definitely! I have to go for the vintage squirrel with acorn basket. Adorable. My favorite item is the vintage ceramic plates (swiss chalet pattern). So lovely! Beautiful post, as always!!! i'll have a look of course! Keep in touch, muchos besos! I am loving the vintage hot wheels, and there are so many great vintage kids books! Great shop! the vintage daisies salt and pepper shakers. Thanks! The vintage Daisies salt and pepper shakers are amazingly cute! i LOVE the milk glass vases (trio). how fun are they?!! I think this is my favorite one! What a fun shop! Some very cool items. I think I like the white milk vases the best. Thanks for sharing this shop. I love looking at everything in there. I really like the brass alarm clock. So exicted to "shop" locally for me. the squirrel basket, hands down! i LOVE squirrels. I love ALL of the vintage floral coffee mugs. When I got married 3 years ago I registered for some gigantic solid colored ceramic plates and bowls which are all chipped already, and aren't really my style anyway. I decided I am slowly going to replace them all with thrifted vintage floral sets. Yeah! Her shop inspires me. the home health guide was fantastic...such great pictures! I love the old english vintage salt and pepper shakers! I want that owl iron candle holder in a serious way! Such a great collection of vintage stuff - love it. So many lovely things!! I really liked the Mid century FIRE KING milkglass VASE. So much great stuff! It all reminds me of my grandy's house. I LOVE the brass duck figurine and the milk glass vases. So cute! I also just tweeted about the giveaway! I love all of the milk glass pieces. So pretty, especially the vases. How fun! I love the milk glass items and those lotus bowls are amazing! The vintage oversized glasses are my fav. Ooh, I absolutely love the Tripl-Aire vintage fan! What a lovely shop! i love the Aluminum 3-canister set or the old Triple Aire fan. FUn stuff!! She'll def. be a new favorite shop now! I love the owl candle holder. It's such a hoot!! I like the brass clock! The Too Many Mittens book is too cute! My great-grandma used to read that to me when I would visit her. I'm in love with the owl candle holder. I have a tattoo of an owl with similar blue and green shades. Gorgeous piece and wonderful little shop! I would be interested in the "vintage WOOD ORGANIZER. Mail holder. Key hooks." oh-my-goodness!! this is one of the best shops I've seen recently!! I love so many things here!! And that set of 5 vintage glassware--that's the same kind my grandmother has in her house and she so kindly gave to me this past Christmastime. ooooo the costume history book!!!!! This olive coffee pot is my favorite http://www.etsy.com/view_listing.php?listing_id=30146056 i love olive, coffee, and tea! I love the vintage glazed cups! I LOVE the "Mid century HAND BAG. Black." so cool!!! Waw, her husband sounds so mysterious! haha. My favourite item is the vintage round floral tin, it's just beautiful and would fit perfectly into my room's interior. i would probably get the destash buttons..
or possibly a couple of books. beautiful collection of things btw. vintage aluminum canisters. those are so awesome! i love the owl from japan! I love the pair of vintage cloth napkins- such a pretty pattern! I love the vintage COSCI handbag. buttery soft woven LEATHER! i LOVE the vintage fan!! thanks! I love the milk glass vases because I just KNOW I would use them!! I love this tea set, http://www.etsy.com/view_listing.php?listing_id=33603214, but there are so any other items that are great and it would be hard to choose! I adore the vintage Harlequin romance novels! SO amazing! Thanks for the chance Danni! Have a wonderful day! I like everything, but what I really love is the Illustrated Library of Arts and Crafts.